Sooooo… I have a problem. It’s actually a really good one to have, I’m just not used to it, or haven’t ever had to think about it before. My little puppy is going so fast that he can’t turn tight. With Lu, our issue was always getting faster. Yesterday I tried Loki for the first time with a tiny little bar doing some cik/cap stuff and oh boy, did our tightness go out the window. I really don’t mind, it’s just something I’ve never had to consider. Whaaaa? Going TOO fast?! Here’s a very good example in the video below. We’d been playing lots of tunnel games this afternoon and I was SO impressed with this little thing we did: first there was the threadle-arm into the not-obvious entrance of the tunnel. Good job puppy. THEN, I tapped my leg (ala “Flappy tappy” to call him right PAST the tunnel, WHICH HE DID, even though I was moving (that had been the trick before: stationary Em = easy to come to hand. Moving Em= might as well do the tunnel) and RAN, and he did it. It was cool. So I filmed it. And watching the film you can see the extreme wideness as he takes the tree on the ‘tok’ side (actually usually his better side) which probably would have helped him not do the tunnel, though to me at the time he was still SO close. I was holding my breath and running to see what he’d do (without looking at, and therefore pointing at, the tunnel entrance). And then he’s started doing this which is also extreme levels of cute. Loki doesn’t really like the water, generally speaking. He’ll sort of go in a bit but doesn’t like to swim. He’s recently discovered though that when he walks through the water it makes splashes that make ripples. And he can bite the ripples and when he does there’s more splashes and more ripples! It’s pretty cute. Meanwhile, we were meant to be moving next Friday to our awesome agility-friendly property, but there are some issues and so might not have anywhere to live as of that afternoon, so that’s pretty cool. I’ve had a few people say we could stay with them, and then I remind them I have 3 dogs (I figure we can cattery the cats if we need to, and actually I could probably shuffle Mallei off to a friend – everybody loves Mal) but that still leaves you with Lu (who is a turd, and injured, so wouldn’t be able to play all day with other dogs, etc.) and Loki (who is young, and a BC, and therefore high-needs). After an absolutely smashing, fantastic, blitzing RC session the other day, I went back this afternoon to have another go with the DW at 1 meter high…. Oh, so lacklustre. I don’t think it was confidence- she tired quickly and was puffing. It was fairly muggy (which she hates) and I left her and Mallei outside today with a bone each so there’s a good chance the two of them were fence running all day and barking at the next door dog. But still, it’s so frustrating. Every time she gets tired or weird I get all paranoid that her ulcers are back… hopefully it’s just fatigue. I’ll take her to school with my on Friday and she can sleep all day and we’ll try again then. In other news, the house I mentioned a while ago – this one – is back up for sale, and we can have it for the price we were negotiating, except only now there’s another house, 20-30 mins closer to my work, less work to be done on the house, but the house just doesn’t “feel” like home… So I don’t know- one is more convenient to where I work now, the other is more convenient to a lot of dog related things and a few friends’ houses (30 mins less to Penny’s house! )… one is in a familiar area, one isn’t… one had a more ‘homely’ feel, and other didn’t… one of them could easily have a large undercover training area built in future… the other couldn’t. 😉 I think we’re both leaning toward the first one – I’m just not particularly looking forward to the commute and/or it means changing schools for next year, and I like my school. Gosh it’d be nice to just be able to have everything in the yard though. To pick the days when she’s excited to train and to let her sleep when she’s tired. To be able to do little sprints with Loki and not run out of room. He’d be about 8 months old by the time we got in there. How scary is that! I almost forgot! We did some more kangaroo training this morning but there were hardly any (I think I was there a bit too early, they seem to come out when I need to be going home so I’m not late) but it’s just beautiful being there at dawn, with clouds hanging in the valley. Um…. yeah. So, I was trying to get a cool shot of Loki with the dawn in the background and… um… this is as good as it got. Pretty high quality photography going on here. See, look, they have kangaroo shapes. Actually, Loki was quite amazing- he’d see the roos, then look at me. He’s understanding this game amazingly well already. Once or twice he thought maybe trying to run would be more fun but of course he was on lead. So obviously the iphone does great slight-zoomed in, low-light photography. Not. This was a big male who hopped across the road in front of me as we were leaving. Back to basics. A bit. For now. Ok, I have a confession to make. 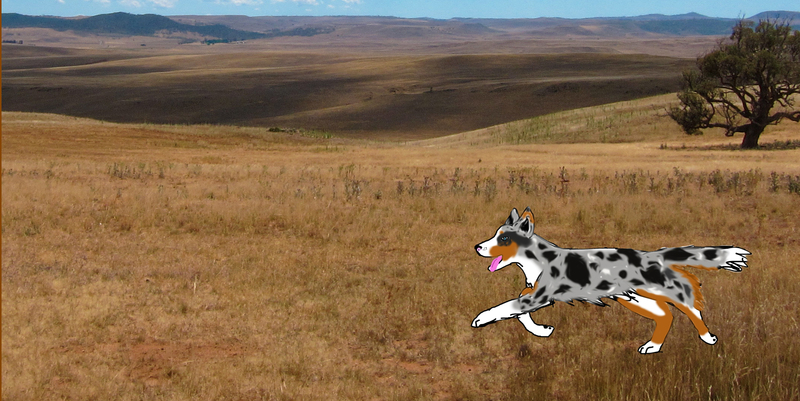 I felt like this post needed a picture, so I thought because I idolise her so much, I’d copy Penny’s idea of awesome Paint-art except I don’t have Paint, I have Photoshop, so one thing led to another and I worked on this stupid picture of Lumen running for AN HOUR now, and put it on the background so that she’s channelling a Cheetah so she gets really fast. If this is how I want to spend my Friday evenings SO WHAT?!!!? You can click on it to make it bigger so my mad skillz of doing eyeballs and stuff aren’t wasted. brainstorms ways to solve problem. Here is my action plan for solving the problem! I shall follow the action plan for the next month! I’VE SPOTTED A NEW, DIFFERENT PROBLEM! FORGET THE OLD PROBLEM, MUST SOLVE NEW PROBLEM! brainstorms ways to solve new problem. Here is my plan for solving the problem! I shall follow the action plan for a month! I was thinking about Lumen’s sequencing the other day and she’s working with me really nicely, but she’s still not fast. I know she’s not a squirrely border-collie running dog, but I also know she can run faster than she is because she does it for RC training and she does it for some of the HGR games, and she even did it the other night when she accidentally took the weaves after a tunnel instead of coming through some uprights. So I’d like more speed. And I was thinking there’s no point doing sequences if they’re not at speed. Sure, she can do them, but meh. So my plan is- lots of recalls on the flat to a tug toy, running and racing. I want to build value for her tug so she actually will play when we’re out and about, which might involve clicking and treats for even attempts at playing while we’re out but I think I need to start there with her because sometimes she’s just not interested in playing with anything, so I want to try and move past that to: you can play, it’s awesome, good girl, now go sniff and stuff again. Hopefully this would then help with rewarding good recalls. Similarly, I’d like her to play the bitey-hands-game (um, not sure how to explain this one, but it’s like how dogs play bite-face with each other except only I use my hands over her nose and mouth and she gets super vocal and excited about it) while we’re out and about but with less biting than I sometimes get, and less jumping on me than I usually get. I also want to do lots of recalls on the flat and throw a toy past me to have her drive to that, then play. More vigorous, exciting play- really amping that up. More single cik/tok wraps and rewarding only the fast or enthusiastic ones with jackpots, and the slow ones we try again – no more rewarding all of them to get her to love the game. THEN I want to do the same as above with the recalls but through some uprights with a ground bar. Then two uprights. Then a tunnel, etc etc etc. Working both on chasing/catching up with rewarding at my side, and driving ahead with a thrown or stationary toy to drive to. Lu is great at the recalls to a toy in my hand on the flat- I want to try and use that enthusiasm and show her that agility is exactly the same. 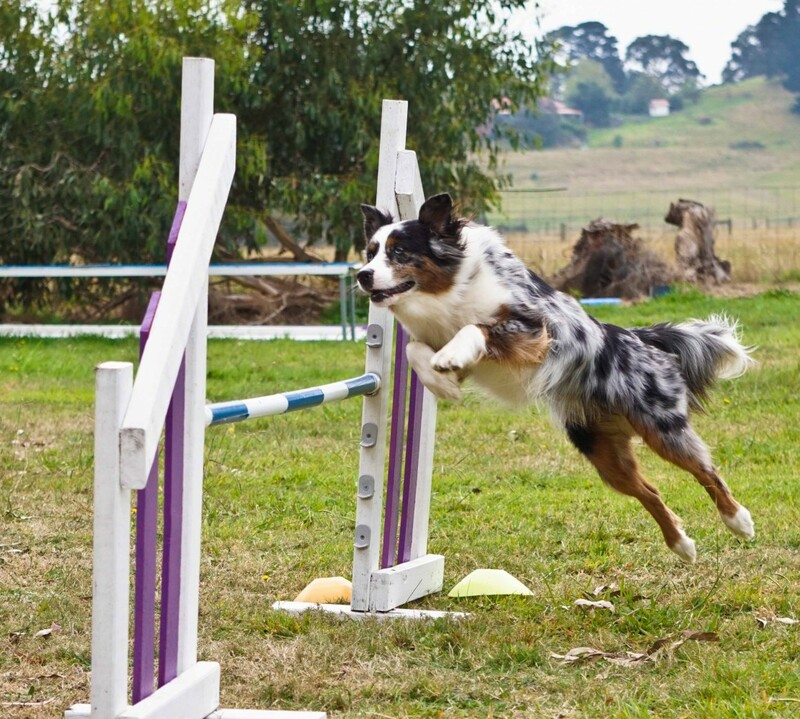 I feel like we started ‘doing obstacles’ from cik/cap which she was pretty ‘meh’ about at first, and then went to jumps in a straight line, which she liked ok… but only did a small amount of ‘running really fast through jumps’. So I’m going to try this. I might even try and try it until I leave for Europe in 2 weeks (omg only 2 weeks. Eek)… meanwhile still doing RC and weaves cos they’re basically the same concept, and my HGR games.